An ideal process must produce without defects and without rework. To expose these unnecessary and costly inefficiencies, you should have the appropriate performance metrics to measure the process yield, or otherwise, you may be misled and the true process yield might be underestimated. These metrics should be able to expose even the smallest inefficiencies in a process enabling operations to understand their true process yield in order to set realistic improvement targets. Many companies utilize two measures of process yield: first time yield and final yield. These companies often find that they have high yield rates and assume that their processes are performing effectively. Both metrics represent the classic approach for calculating process yield and don’t account for the hidden factory. First Time Yield (FTY) is simply obtained by dividing the good product or service units (including reworked units) by the number of total units that entered the sub-process. For example, the first time yield of an individual sub-process that processed 100 units and produced 90 good units would be 90/100 or 90 percent. First time yield is not sensitive to product complexity and only looks at the volume of the produced units. Corrective actions are often taken on spot when mistakes are discovered and rework are not recorded in quality logs making the process yield rate looks better than what it really is. 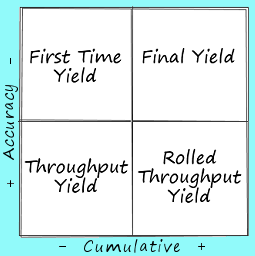 Final Yield (FY) is another widely used metric that is easy to calculate using readily available data. It is the probability that a unit will successfully pass all steps assessed at the end of the process. It is obtained by counting the good units that made it through until the last process step divided by the total number of units that entered the process. In other words, if there are the same amount of units at the end of the process as there were at the beginning, then the final yield would be 100 percent. The first time yield and the final yield metrics don’t reflect the actual defect rates and ignore the hidden factory. Throughput Yield (TPY) on the other hand is a good metric to start with for measuring the process yield for a single sub-process. 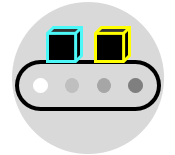 It is the probability that all defect opportunities produced at a particular step in the process will conform to their respective performance standards. It only considers the good units that passed through a process step right the first time and error-free. A reworked unit that passed the test is not added to the throughput yield but to the first time yield. The difference between the two metrics should highlight the quality risk due to rework and should lead to the pursuit of process improvement. Rolled Throughput Yield (RTY) = Throughput Yield of process step 1 * Throughput Yield of process step 2 * … * Throughput Yield of process N.
Rolled throughput yield quantifies the cumulative effects of inefficiencies found throughout the process and provides a better insight of the rates of errors and rework. It allows companies to be much more accurate when assessing the performance of their industrial or commercial processes because calculations are done at each process step. Rolled throughput yield is substantially less than final yield, and companies that calculated their final yield at 90 percent might find that their rolled throughput yield is only 20 percent. Consider a process that has 3 steps performing at a 0.94, 0.91 and 0.92 respectively. Suppose that 100 units entered the process and only 89 were good units. In this case, the final yield would be 89%, and the rolled throughput yield would be: 0.94 x 0.91 x 0.92 = 78.7%. This means that even if the 3 processes are performing fairly well, one out of every 5 units will not make it through the process without being scrapped or reworked. In the following example, the probability of manufacturing a can that meets all performance standards is 90.28% (RTY = 90.28%). Using of a process map as a guide in the process yield evaluation is a good practice and can be very helpful. Throughput yield is sensitive to the number of critical-to-quality characteristics (CTQs) in a product (product complexity), while rolled throughput yield is sensitive to the number of CTQs, the effectiveness of the process, and the number of process steps (process complexity). Rolled throughput yield can rapidly decrease as the number of steps increase. The more process steps there are, the more challenging it will be to get a unit through the process without problems. This is why operations must have high throughput yields at each step in order to achieve a higher process yield rate. Simplification of the process is another area that needs to be considered to improve the process yield rate.